This is a lovely sewing pillow stitched in antique Dutch samplers motifs with the beautiful silk threads from Valdani over the wonderful linen by Manifattura Tessile Sotema, Italy. 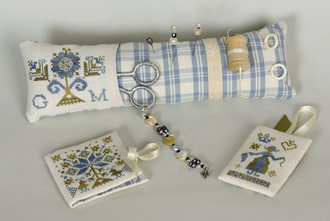 Chartpack includes original linen fabric, stitching and finishing instructions, and threads conversions for DMC cotton threads (even though the final result might be slightly different from the original). Fabric one 8 5/8 x 8 5/8 in (22x22 cm) piece of Assisi Avorio linen (28 ct / 11 fili) by Manifattura Tessile Sotema, included in the chartpack. The fabric includes seam allowances.